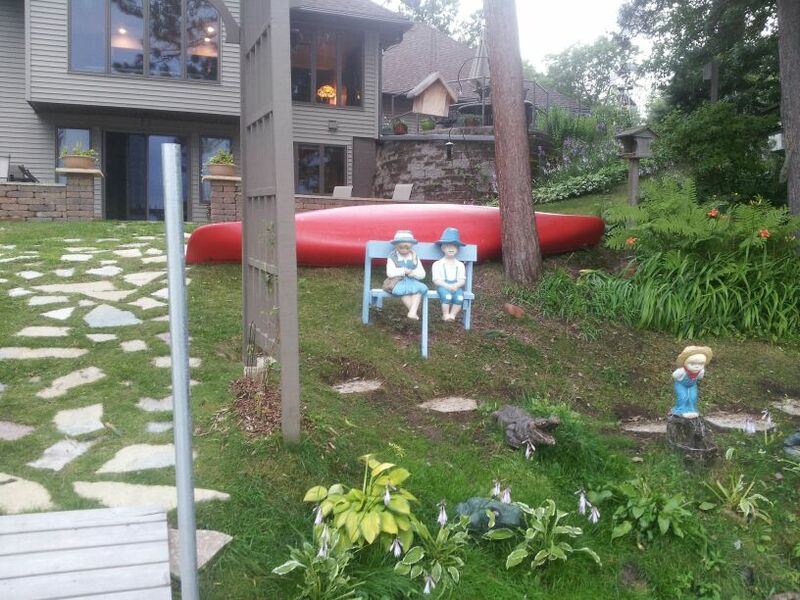 We “inherited” a trio of cement garden figurines when we purchased the Wisconsin lake home we call Northern Bliss. Noting their blue-and-white outfits, we assumed them to be of Swedish descent. We named the couple wired to the wooden bench Ole and Lena. I proceeded to paint the bench baby blue to match their clothes. We rescued a little boy figurine from the weeds near the lake, placed him on a tree stump, and called him Sven. Growing up in Wisconsin, I’d heard plenty of Ole & Lena jokes. My German father Lester liked to use them to tease my Swedish mother Sigrid, so I assumed that they were Swedish put-downs, like the Polish jokes that also circulated in the Midwest. 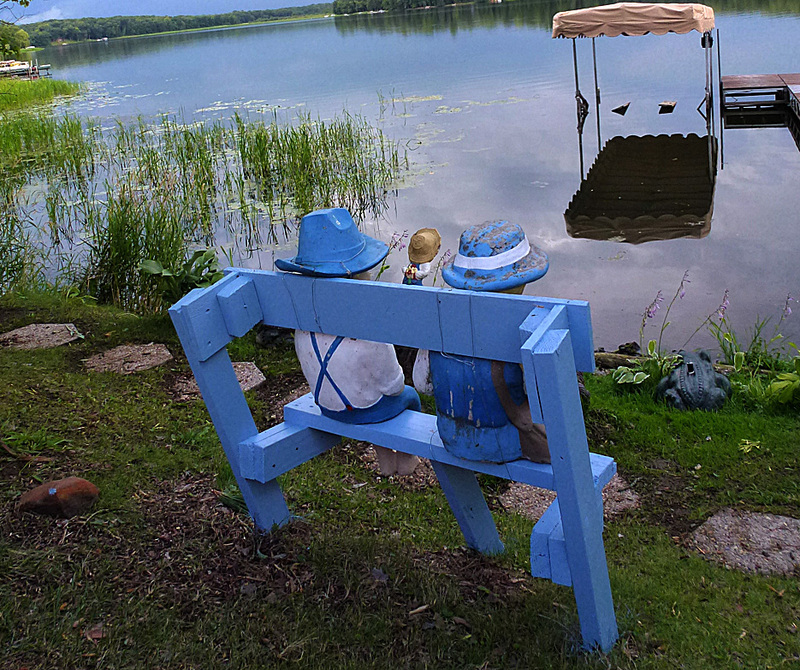 Last week, soon after repainting that bench and securing the figures, I read a notice in the Amery Free Press about the a play being put on by the Amery Community Theater called “Ole & Lena Go to da Lake.” This would be an excellent opportunity to acquaint Günter, who emigrated from Germany, with my Swedish heritage. Or so I thought. Ole (Jim Thompson): Thick-headed Scandinavian, fond of fishing, campfires, and beer. Loves his wife so much he almost told her once. Lena (Laura Sjogren): Ole’s long-suffering bride. Scandinavian down to her socks, but strangely passionate when it comes to stoic Ole. Sven (Scott Kaml): Odiferous fishing partner and best buddy to Ole. Guileless. Every now and then he stops to think, but forgets to start again. After we returned, I asked Gunter whether he’d ever heard Ole & Lena jokes in Europe. “No, they only told Polish jokes,” he answered. Ole and Lena got married. On their honeymoon trip they were nearing Minneapolis when Ole put his hand on Lena’s knee. Giggling, Lena said, “Ole, you can go a little further now if you want to …” So Ole drove to Duluth. To read more Ole and Lena jokes, click here. Uff da – walking to the next room and then wondering what you wanted. Uff da – waking yourself up in church with your own snoring. Uff da – when something doesn’t work out, such as trying to pour two buckets of manure into one bucket. Uff da – (for the guys) when your two “steady” girl friends find out about each other.